Bone histology says ectothermic goats, but does it? Once again the blog has taken a backseat to my real life work. It’s unfortunate too as there have been at least three really interesting news stories / technical papers that I feel the need to tackle. The first story I want to talk about is the news of the ancient Mediterranean goat: Myotragus balearicus, and its alleged “reptilian” physiology. On the outset M.balearicus appears like your standard goat; complete with horns, hooves and (likely) a penchant for eating practically anything. The part that makes M.balearicus stick out the most? is that it was a native inhabitant of small islands in the Mediterranean.? Modern goats reach islands through human intervention. There, they become invasive elements that often damage the native flora and fauna. Without human intervention, it is hard for goats – and indeed? most mammals – to become established on islands. Both getting to the islands, and surviving on them tend to require animals that are more metabolically adaptable. Despite their catholic diets, goats are still limited by the “always on” nature of mammalian metabolism. At least, that’s what we thought. 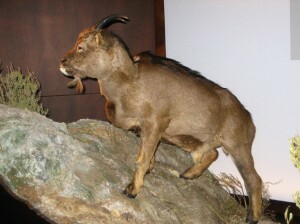 Researchers at the Institute of Paleontology at the Autonomous University of Barcelona, looked at microslices of the bones in this goat. What they found was a pattern of bone deposition that is unusual for ungulates. Rather than have layers of bone strewn about in an interwoven pattern, the bone of M.balearicus was laid down evenly in concentric layers. The latter formation is often assumed to be a hallmark of reptiles and other “slow growing” animals. With this in mind, the authors suggest that M.balearicus had evolved a more plastic metabolism. These findings lend support to the model that posits a shift in life history strategies to a lower end of the growth rate spectrum, in areas where mortality remains low. The results, while interesting, bother me a bit, as they rely on certain views on reptile growth strategies that are known to be false. Ectotherms are characterized by lamellar-zonal bone throughout the cortex. True zonal bone with growth marks deposited seasonally throughout ontogeny is a general ectotherm characteristic. In ectotherms, the bone matrix consists of slow growing lamellar bone. While it is true that there are ectotherms that grow in a cyclical manner like this (especially animals from temperate regions), this is not a given for all ectotherms. In fact, it has since been well documented that fibrolamellar bone deposition occurs normally in crocodylians, as well as turtles (Reid, 1997). It is a tad strange, as the authors do cite the Turmarkin-Deratzian gator paper, but they erroneously use it as an example of slow growth and contrast it with the fast fibrolamellar growth seen in most ungulates.? There is even a figure in the paper that shows, and even labels fibrolamellar growth in a crocodile, yet appears to get completely glossed over when it comes time to talk physiology. Which brings me to my next point. The authors argue that the presence of lamellar zone bone in M.balearicus is suggestive of an ectotherm-like growth strategy. But does lamellar zone bone really indicate slow growth? Work by Tomasz Owerkowicz on varanids (Owerkowicz 1997),? found that even the sedentary animals in his control group, could lay down bone at the same rate as his sedentary mammals (Morell 1996). Presumably this bone was lamellar zonal, though without the figures on hand, I can’t say for sure. A more prominent example comes from Lieberman and Crompton (1998), who did a stress study on goats and opossums. The authors were looking at the remodeling response of bone to stress, and accidentally came across an interesting growth difference between these two taxa. They found that their opossums grew at a significantly faster rate than their goats, despite both taxa being of a developmentally equivalent stage. The interesting part is that the goat’s were depositing fibrolamellar bone, while the opossums were producing lamellar bone. So no, lamellar bone need not be a hallmark of slow growth. Rather, it might be a response of the bones to specific stresses. Lamellar zonal bone is structurally stronger than fibrolamellar bone, so there might have been a more functional need for this type of bone. The reptile-like physiological and life history traits found in Myotragus were certainly crucial to their survival on a small island for the amazing period of 5.2 million years, more than twice the average persistence of continental species. Therefore, we expect similar physiological and life history traits to be present in other large insular mammals such as dwarf elephants, hippos, and deer. However, precisely because of these traits (very tiny and immature neonates,low growth rate, decreased aerobic capacities, and reduced behavioral traits), Myotragus did not survive the arrival of a major predator, Homo sapiens, some 3,000 years ago. Now I’m sure that there was a need to inject some melodrama at the end (as is typical for many papers), but the assertion that a “reptile-like physiological life history” must also incorporate a small aerobic scope, small neonates and reduced behavioural repertoire, is just uncalled for. All of these are frustratingly common misconceptions about reptiles, and bradymetabolic animals in general. Further, none of these assertions are based on any facts for M.balearicus. The only assertion that could really be tested is the small neonate one, and that appears to be falsified, as data on newborn M.balearicus show that newborns were large and precocial animals; pretty standard fare for an ungulate. Overall the results of this study are interesting, and I look forward to seeing if pygmy elephants and hippos also display this apparent “slow growing” bone type. Comparing M.balearicus to reptiles based off this one similarity appears unjustified, and only goes to further perpetuate some common reptile misconceptions. Needless to say, Myotragus balearicus was probably not “cold-blooded,” despite what the news headlines would have one believe. Next up: Destroying the “uncaring parent” myth. Morell, V. 1996. A Cold, Hard Look at Dinosaurs. Discover. December. Available online.